Expedition 36 Flight Engineers Chris Cassidy of NASA and Luca Parmitano of the European Space Agency have completed the first of two key EVAs on the outside of the International Space Station (ISS). The spacewalks are laying the foundations for the arrival of the Russian Multipurpose Laboratory Module (MLM) at the end of the year. EV-1 Cassidy, who was on his fifth EVA, worked alongside EV-2 Parmitano, who was making his debut EVA – the first time an Italian had been involved in a spacewalk. Following pre-sleep tasks, the Expedition 36 crew helped the spacewalking duo through a procedure that allows for spacewalkers to avoid the overnight campout in the Quest Airlock. Known as the In-Suit Light Exercise (ISLE) EVA Pre-Breathe Protocol, the procedure allows for pre-EVA conditioning of the spacewalkers set to head outside of the orbital outpost. Debuted during STS-134, the procedure does not require overnight campout in Quest or CEVIS exercise, which helps conserve oxygen usage aboard the ISS. For the actual procedure, the two spacewalkers performed a 60-minute mask pre-breathe with the airlock depressed to 10.2 psi. They then donned their spacesuits (EMUs) and performed standard EMU purge before the airlock was repressurized to ISS ambient levels. 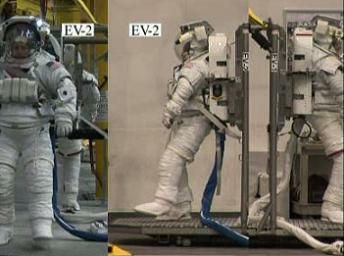 The full procedure document for EVA-22 is available in L2. Following this, the EVA crew spent 100 minutes performing in-suit pre-breathe, 50 minutes of which will consist of light in-suit exercise with 50 minutes of resting (nominal) in-suit pre-breathe. The two spacewalkers then exited the Quest Airlock, with Cassidy moving to the top of the Z1 truss to remove and replace a Space-to-Ground Transmitter Receiver Controller that failed at the end of last year. Meanwhile, Parmitano set off towards the starboard truss segment in search of the Express Logistics Carrier-2 (ELC-2). Once there, he retrieved two experiments that were part of the Materials International Space Station Experiment-8 (MISSE-8). Specifically, the Italian removed the Optical Reflector Materials Experiment III (ORMatE-III) and the Payload Experiment Container – which assessed the impacts of the space environment on materials and processor elements. Both experiments will head back to Earth via SpaceX’s Dragon at the conclusion of its CRS-3 (SpX-3) mission, which is scheduled to take place either at the end of this year, or early in 2014. Parmitano also photographed the Alpha Magnetic Spectrometer-02 (AMS-02) – which has been providing huge amounts of data since arriving via Endeavour during STS-134 – to provide a visual assessment of its current condition. Once both spacewalkers completed their initial tasks, they combined forces to remove two Radiator Grapple Bars (RGBs) that had arrived on the CRS-2/SpX-2 Dragon, allowing them to install one on the port side truss and the other on the starboard side. Parmitano transported the RGBs to the worksites – whilst riding on the end of the Space Station Remote Manipulator System (SSRMS) under the control of Flight Engineer Karen Nyberg – where Cassidy bolted them down into position. On the return trip, Parmitano removed the Mobile Base Camera Light Pan-Tilt Assembly, which failed during the arrival of the Japanese HTV-3 cargo vehicle last year. The assembly will eventually be returned to Earth for refurbishment, potentially allowing it to ride back up to the ISS as a spare. Meanwhile, Cassidy routed power cables to support the addition of the new Russian Multipurpose Laboratory Module (MLM) scheduled to arrive at the station later this year. The new module – as over-viewed in a new L2 presentation – will serve as a research facility, docking port and airlock for future Russian spacewalks and will replace the Pirs module. The NASA astronaut routed cables from the Unity node to the interface between the Pressurized Mating Adapter-1 and the Zarya module, laying the foundations for a Russian EVA to complete the required tasks later this year. Cassidy then installed one of two Z1 truss Y-bypass jumpers to provide power redundancy and stability for critical station components – part one of a task that will be completed during next week’s EVA-23. 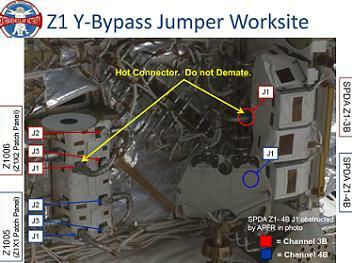 NASA information notes that in conjunction with some cable reconfigurations completed earlier this year inside Unity, the two Y-bypass jumpers will allow the station team to quickly regain critical loads in the event of a loss of one of the external power modules without the need to commit to a spacewalk. The duo were then to carry out the tricky task of installing a multi-layer insulation (MLI) cover to protect the docking interface of Pressurized Mating Adapter-2 mounted to Node 2. However, Parmitano managed to complete the task – which he described as like “making the bed all by yourself (in a vacuum)” – on his own. 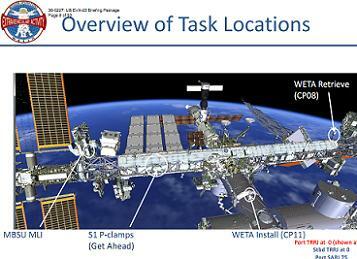 The duo managed to complete all required EVA-22 tasks ahead of schedule, allowing for some get-ahead work – mainly related to photography and inspection – ahead of their next trip out of the Quest Airlock in just four days time, involving the EVA-23 tasks that includes work to remove alignment guides from the radiator grapple bars and move them to External Stowage Platform-2 (ESP-2). Next on the list will be work to route networking cables to the upcoming MLM location and remove insulation from one of the station’s Main Bus Switching Units. After installing a second Z1 truss jumper cable, the two astronauts will work to replace a camera on the Japanese Experiment Module Exposed Facility and install cables for the fixed grapple bar’s module’s power and data grapple fixture. 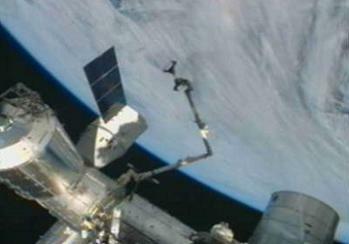 Some of this work was completed during EVA-22. 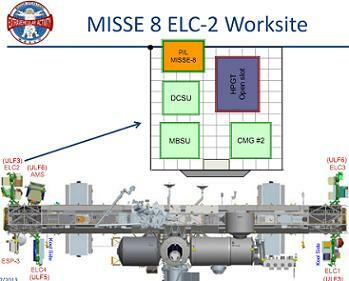 Their final task will be to relocate the Wireless External Transceiver Assembly and the Video Stanchion Support Assembly from Camera Port 8 to Camera Port 11 on the truss. If time permits, the two spacewalkers will work to finish up get-ahead tasks from the previous spacewalk including the release of clamps on the S1 truss and relocating an articulating portable foot restraint. Two more EVAs, to be conducted by Yurchikhin and Misurkin, will round off a busy Expedition 35-36 on the ISS.